About 200 femtoseconds after you started reading this line, the first step in actually seeing it took place. In the very first step of vision, the retinal chromophores in the rhodopsin proteins in your eyes were photo-excited and then driven through a conical intersection to form a trans isomer . The conical intersection is the crucial part of the machinery that allows such ultrafast energy flow. Conical intersections (CIs) are the crossing points between two or more potential energy surfaces. These tend to repel when they approach each other, but cannot stay separated everywhere in the multidimensional geometry landscape of a molecule. CIs are ubiquitous in photo-processes in polyatomic molecules and govern key phenomena such as DNA photostability , but they are difficult to locate, measure and control, since their positions and features depend on specific molecular system under study. It is therefore of great interest to simulate their effects. The case for diatomic molecules is different because naturally occurring CIs cannot exist for them: Energy levels are repelled when they approach each other, and there are not enough degrees of freedom for a true crossing. However a strong laser field applied to a diatomic molecule adds one additional degree of freedom, which gives rise to a light-induced artificial CI (LICI) that is predicted to have several features in common with the poly-atomic “wild-type” CI [3-5]. More recent theoretical studies have examined various aspects of this LICI phenomenon [6-9]. The molecular dynamics in the vicinity of a LICI can be explored in the simplest laser-illuminated molecular system, the ground state of the hydrogen molecular ion, H2+ . An infrared laser will induce interactions between the two lowest nuclear potential energy curves, named 1sσg and 2pσu. The interaction of strong fields with H2+ can be expressed by shifting one of the potential curves by the energy of one photon. The now ”dressed” potential curve crosses at some internuclear separation R where the two states are resonantly coupled by the laser field, the analog of the curve crossings at CIs in polyatomic molecules, as seen in Fig 1(a) . We define the LICI as this crossing point, when the polarization of the laser is perpendicular to the molecular axis. For other angles, there is no crossing, and the dynamics is “adiabatic”, that is, a nuclear wavepacket will travel only on one of the dressed potential curves. Consider for a moment what it means to have a point of crossing where the field is perpendicular to the molecular axis of a diatomic molecule: This molecule effectively “feels” zero laser field only at this specific angle, so the potential curves assume their field free R-dependence only here. The key to the dynamics induced by the LICI is the special behavior of the molecule as it rotates through this special point, from an angle on one side where it experiences the field, to an angle on the other side where the field is once again felt. The simplest place to start is H2+ in its ground rotational state, interacting with a strong laser field that couples resonantly the two electronic states. The spherical symmetry of the ground state field-free nuclear probability density, changes rapidly when a strong field is turned on. We can follow how this probability density evolves in the dressed state framework. In the dressed picture, the LICI is a local maximum in the two-dimensional (R,θ) potential energy landscape, while in other angles, the population dissociates adiabatically on the unbound part of the light induced potential curve. This causes the part of the population to accumulate around the LICI and then scatter from it, similar to waves scattering from a cone shape potential barrier. However, unlike scattering of a free particle around a barrier, the scattering described here is of bound nuclear wave packet, which scatters into a multitude of rovibrational states on the ground electronic surface, similar to the non-adiabatic dynamics around a natural CI. The scattering from the LICI leads to dissociation, but imposes a scattering time delay. The coherent addition of all the scattering trajectories creates an interference pattern at various angles and kinetic energy releases (Fig 1 (b), and Fig 1(c)). These quantum interferences are a universal signature for LICIs because they arise from the nature of coherent scattering interference near a point of degeneracy. Figure 1: [Click on the image to view with higher resolution] (a) The dressed potential energy surfaces of H2+ featuring LICIs. (b) The calculated instantaneous probability of dissociation P(θ,t)diss from a given vibrational state (for example, v=9) during the interaction with the laser pulse reveals the interference. (c) Experimental (top) and calculated (bottom) angular distributions of H2+ dissociation at kinetic energy releases that correspond to specific initial vibrations states. We have experimentally demonstrated the effects of LICIs on strong-field photodissociation of H2+ by means of quantum interferences that modify the angular distributions of the dissociating fragments . The interferences depend strongly on the energy difference between the initial state and the LICI. The larger the overlap between the initial state and the LICI, the larger the effective duration of interaction and the more developed the interferences. For example, we can compare the effect among different initial states, starting from an initial state that is nearly resonant, hence has a large overlap with the LICI, such as the vibrational level v = 9 in H2+, to a state that is non-resonant such as v = 7. We observe in both calculation and experiment how these initial states indeed capture the different effective duration of the interaction with the LICI (Fig 1(c)). LICIs are particularly attractive for future quantum control experiments due to their high degree of controllability using the polarization and frequency of the laser. The interaction is not limited to just a single LICI, and allows control of the timing of its appearance as well. Understanding the dynamics induced by LICIs will facilitate understanding and applicability to systems of higher complexity. Implementing and understanding LICIs in more complex systems will open the way to novel spectroscopy techniques in physics and chemistry. Dario Polli, Piero Altoè, Oliver Weingart, Katelyn M. Spillane, Cristian Manzoni, Daniele Brida, Gaia Tomasello, Giorgio Orlandi, Philipp Kukura, Richard A. Mathies, Marco Garavelli, Giulio Cerullo, "Conical intersection dynamics of the primary photoisomerization event in vision", Nature, 467, 440 (2010). Abstract. B. K. McFarland, J. P. Farrell, S. Miyabe, F. Tarantelli, A. Aguilar, N. Berrah, C. Bostedt, J. D. Bozek, P. H. Bucksbaum, J. C. Castagna, R. N. Coffee, J. P. Cryan, L. Fang, R. Feifel, K. J. Gaffney, J. M. Glownia, T. J. Martinez, M. Mucke, B. Murphy, A. Natan, T. Osipov, V. S. Petrović, S. Schorb, Th. 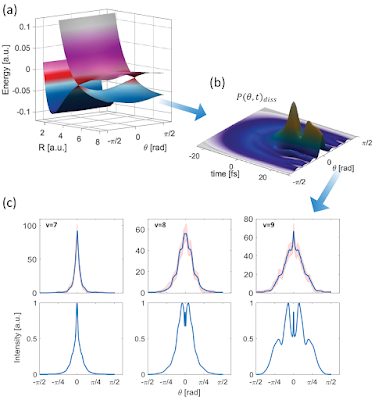 Schultz, L. S. Spector, M. Swiggers, I. Tenney, S. Wang, J. L. White, W. White, M. Gühr, "Ultrafast X-ray Auger probing of photoexcited molecular dynamics", Nature Communications, 5, 4235 (2014). Abstract. Nimrod Moiseyev, Milan Šindelka, Lorentz S. Cederbaum, "Laser-induced conical intersections in molecular optical lattices", Journal of Physics B, 41, 221001 (2008). Full Article. Milan Šindelka, Nimrod Moiseyev, Lorentz S. Cederbaum, "Strong impact of light-induced conical intersections on the spectrum of diatomic molecules", Journal of Physics B, 44, 045603 (2011). Abstract. Nimrod Moiseyev, Milan Šindelka, "The effect of polarization on the light-induced conical intersection phenomenon", Journal of Physics B, 44, 111002 (2011). Abstract. Gábor J. Halász, Ágnes Vibók, Nimrod Moiseyev, Lorenz S. Cederbaum, "Nuclear-wave-packet quantum interference in the intense laser dissociation of the D2+ molecule", Physical Review A, 88, 043413 (2013). Abstract. Gábor J Halász, Ágnes Vibók, Nimrod Moiseyev, Lorenz S Cederbaum, "Light-induced conical intersections for short and long laser pulses: Floquet and rotating wave approximations versus numerical exact results", Journal of Physics B, 45, 135101 (2012). Abstract. Gábor J. Halász, Ágnes Vibók, Milan Šindelka, Lorenz S. Cederbaum, Nimrod Moiseyev, "The effect of light-induced conical intersections on the alignment of diatomic molecules", Chemical Physics, 399, 146 (2012). Abstract. G.J. Halász, A. Vibók, L.S. Cederbaum, "Direct Signature of Light-Induced Conical Intersections in Diatomics", Journal of Physical Chemistry Letters, 6, 348 (2015). Abstract. Adi Natan, Matthew R. Ware, Vaibhav S. Prabhudesai, Uri Lev, Barry D. Bruner, Oded Heber, Philip H. Bucksbaum, "Observation of Quantum Interferences via Light-Induced Conical Intersections in Diatomic Molecules", Physical Review Letters, 116, 143004 (2016). Abstract.